This chapter presents the theoretical basis of the vague knowledge search algorithmization of a rough method. It introduces some data granulation method which aggregates this data as rough sets of data or ways to search this data in the semantic networks. 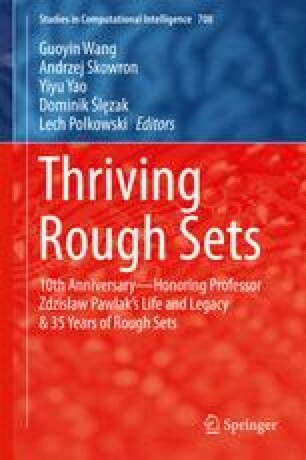 As a result of this method is the possibility of the rough sets description, analogically to sets in the classical theory of sets. We try to answer the question how the agent searching some knowledge can conceive the search of vague knowledge in the semantic networks: (1) if it can, accordingly to the semantic and the conceiving rules, describe the relationships between nodes in this semantic network which are identified as ways of searching knowledge, (2) if it can approximate sets of this ways by using ways described by some concepts and roles.